Far more thought-provoking than the "chick-lit" label would indicate, Where'd You Go, Bernadette? addresses deeply felt issues of motherhood, class and the art of creation (or is it the creation of art?). 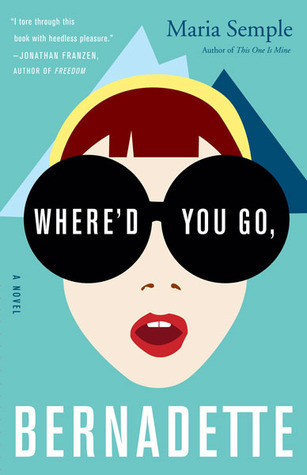 Where'd You Go, Bernadette? is written as a collection of documents - letters, emails, blog posts, reports - gathered by Bernadette's daughter, Bee, in an attempt to track her mother's whereabouts after her disappearance, with occasional explanatory interludes by Bee tying them all together. The story moves along at a good clip and is alternately laugh-out-loud funny and tear-jerking with its sincere sentiment. In some ways, Where'd You Go, Bernadette? is a cautionary tale, a warning of what happens to a woman who - voluntarily or not - gives up on actively using and developing her talents. The mean-spirited destruction of Bernadette's architectural masterpiece shattered her spirit, replacing her enthusiasm and creativity with doubt and resentment. She feels that she is a failure, "an artist who couldn't overcome failure." This lack of confidence was only compounded by a series of devastating miscarriages - "I can't make anything without destroying it" - followed by the birth of sickly baby girl. In a desperate moment, Bernadette bargained with God: "'I will never build again,' I said to God. '...if you'll keep my baby alive.' It worked." But at what cost to Bernadette herself? One brief, but poignant, moment stayed with me. One of the documents Bee publishes is an article about Bernadette in Artforum magazine. The article's author mentions doing a Google search to try to discover what the elusive Bernadette Fox is up to years after falling off the architectural map. He finds a listing in a school auction brochure for a tree house designed and built by Bernadette. That no one bid on. The one tentative attempt she made to reach out and try to practice her art again was completely unappreciated. Ms. Semple skillfully juxtaposed the mind-numbing mundanity of domesticity with the depth of emotion that being a parent prompts, which is very much how I experience parenthood. One minute I'm wiping down the table or doing the dishes yet again and the next I'm kissing a boo-boo and hugging a tearful boy, almost floored by how much I love the little stinker. Ms. Semple captured this particularly well through Bee's eyes. After listening to "Here Comes the Sun" in the car together, Bee notices her mom tearing up and protests. "'Mom!' This is why I didn't want her to come to the first-grade elephant dance. Because the most random things get her way too full of love." Sorry, kiddo. It's part of being a parent. For that matter, it's a part of life whether you're a parent or not. Bee attends a nativity play with a friend's church youth group and is moved by the humanity and love she feels not only from those joyfully experiencing the play and music in the moment with her, but all those that contributed to keeping her alive as a baby and all of those who have influenced her life since then. Maybe that's what religion is, hurling yourself off a cliff and trusting that something bigger will take care of you and carry you to the right place. I don't know if it's possible to feel everything all at once, so much that you think you're going to burst...I felt so full of love for everything. But at the same time, I felt so hung out to dry there, like nobody could ever understand. I felt so alone in this world, and so loved at the same time. Bernadette is not always likable, however, which I thought was a strength of the book. It showed Bernadette as a real, three-dimensional person, full of flaws and quirks, rather than just as a victim or heroine. She is downright dismissive and disdainful of the other parents at her daughter's school - she calls them "gnats" - and I got annoyed by her unexamined privilege and warped sense of reality due to the insane amount of money her husband makes working at Microsoft. Something's wrong? Let's throw lots of money at it until it goes away! That makes it all better! There were a few times I had to suspend my disbelief to make a plot point work, though I'm not going to spell those out in the interest of remaining at least partially spoiler-free. But on the whole, this book really worked for me as an affirmation of each person's need to do what s/he was meant to do, and of the deep love that can coexist with "the banality of life."